Jill Schramm/MDN Workers with Wanzek Construction position the first beam for the U.S. Highway 83 Bypass bridge Thursday. All beams are expected to be in place by the end of this week. Minot residents can expect another couple of months of road construction, but projects are moving along at a pace that should wrap them up on schedule, according to state and city officials. “So far everything has been going very well. The dry weather hasn’t been good for people’s yards but as far as building streets, it’s been phenomenal,” City Engineer Lance Meyer said. A street sealing project that got underway last week should finish by the end of August. The street sealing is occurring in multiple areas around the city. Although the neighborhood projects advance quickly, homeowners will encounter some short-term inconvenience. “We are trying to get these newer subdivisions sealed that have been paved in the last five years to protect that investment,” Meyer explained. Within the next few weeks, work will begin on replacing concrete panels on Broadway that have been cracking. Removing panels, adding concrete and allowing it to cure takes on average 2-1/2 days. Motorists will encounter sections of roadway where closures create two-lane, head-to-head traffic during the replacement process. 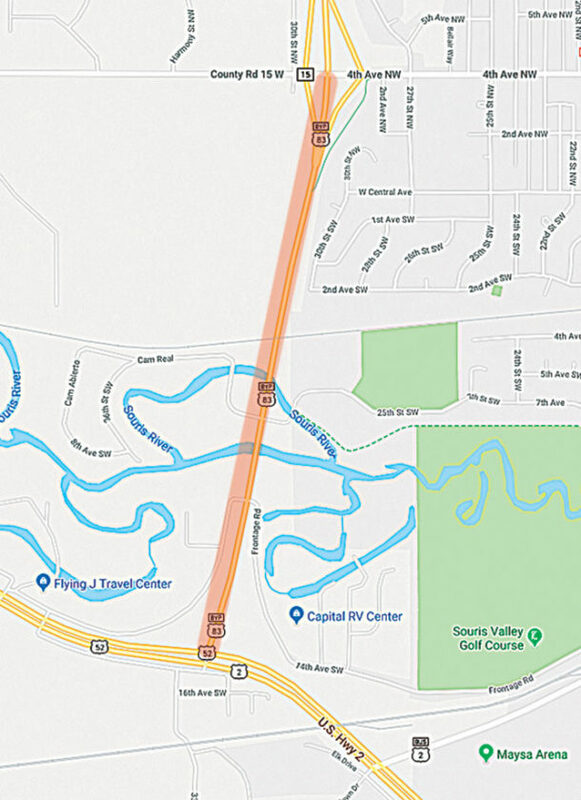 Mandy Taniguchi/MDN A map shows the boundaries of the U.S. Highway 83 Bypass four-laning project, which includes a new bridge over the Souris River for the northbound lanes in this second and final year of the project. Meanwhile, the large, season-long projects continue to make progress. 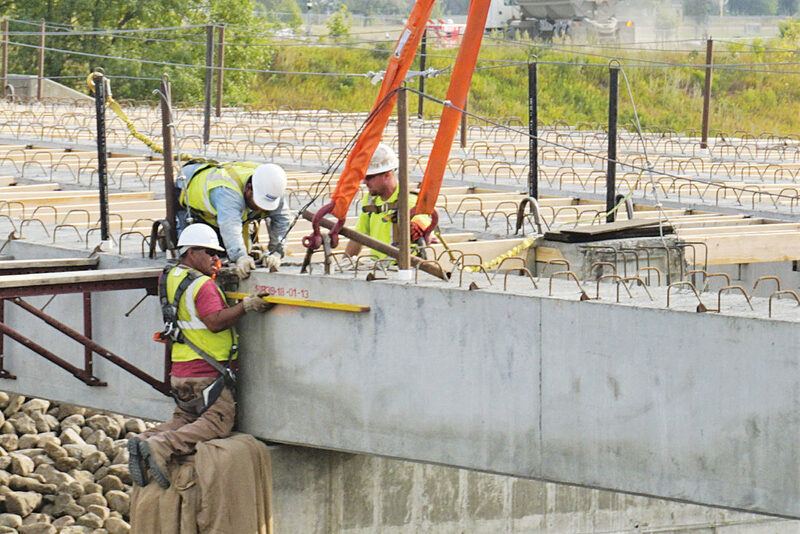 The concrete piers and abutments for the U.S. Highway 83 Bypass bridge over the Souris River have been constructed. Crews began installing beams Thursday. The deck is expected to be poured in late September or early October, said Jim Redding, Minot District engineer with the North Dakota Department of Transportation. Pieces of the roadway are being paved as they become ready. The completion date is late October, at which time the roadway will be opened to traffic. The Broadway Bridge project also is moving along well, he said. 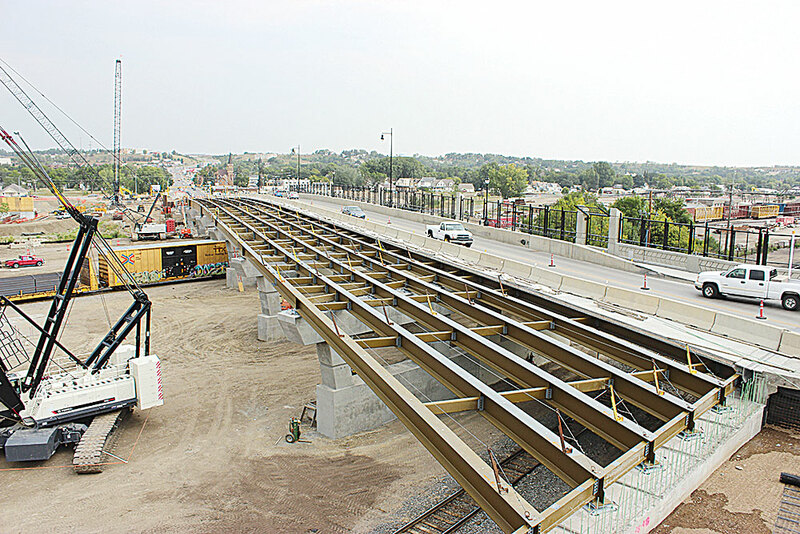 Submitted Photo Work continued this month on constructing the westside Broadway Bridge as shown in this photo from Odney/NDDOT. The work has a Nov. 1 completion schedule. Substructure work has been completed. Steel girders are in place, and work has started on the deck forms. Work on the deck forms is expected to take about a month, after which time the concrete can be poured. Completion is scheduled for early November. Work continues on the intersection at 42nd Street and U.S. Highway 2 East, which is being realigned and signalized. The first pavement has been installed on the outside lanes, which now are open to traffic, Redding said. Curb and gutter are being placed for the various islands and the service roads. Contractors were continuing to install underground utilities this past week, and work was being performed on the inside lanes to prepare them for paving. The project to improve visibility and turn lanes should finish in mid-October. “It will be just all the way around a safer intersection,” Redding said. Mandy Taniguchi/MDN A map shows the boundaries of the Broadway Bridge project. The intersection was among those identified in a 2006 traffic study as needing safety improvements. Among other U.S. 2 & 52 intersections identified were 13th Street and Sixth Street, where changes since were made. Other intersections on the list are being reviewed, Redding said. No additional intersections are scheduled for next year. Another project that started this past week is the microsurfacing of all four lanes on U.S. 2 & 52 from 16th Street Southwest to 55th Street Southeast. Microsurfacing involves the application of a rock, oil and cement mixture. The maintenance work should be completed in another week, Redding said. Motorists will encounter sections of the four-lane where traffic is reduced to one lane in each direction. Redding reminds people to be aware and slow down when traveling through construction areas. Microsurfacing also is occurring on Burdick Expressway from 42nd Street to U.S. 2 and on 42nd Street between Burdick Expressway and U.S. 2. During the microsurfacing projects, speeds will be reduced and a width restriction of 15 feet will be in place. Some intersections may close for short periods or brief delays may occur. Flaggers will be present. Within Minot, a project that is continuing is cement stabilization and repaving south of Washington Elementary on Sixth Street Southeast between 18th and 20th Avenues. The work should be done in about two weeks. Mill and overlay on a short stretch of road on Fourth Street Southeast downtown, between the Ward County Jail and Minot Daily News, hasn’t yet started but will take about two weeks to complete once it commences. The work also involves removing old sewer line and replacing catch basins. 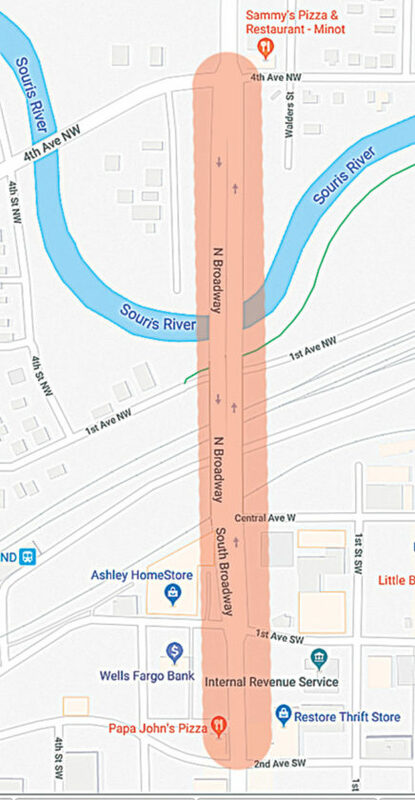 The portion of 16th Street Southwest from Burdick Expressway to 11th Street Southwest will be down to one lane in each direction, possibly around mid-October, to repair pavement. The work is expected to take about a week and half. One of the last projects before construction season ends will be repairing the pavement at the intersection of Burdick Expressway and Third Street Southeast, the street in front of the Ward County Courthouse. This past week, the city finished a significant project in completing improvements on Hiawatha Street between 11th to 16th Streets Southeast. The street has been re-opened. Work that has been occurring on U.S. Highway 52 in the Minot region also has come to an end. The work between Donnybrook and Brooks Junction on Highway 52 is done, Redding said, as is the new paving from Sawyer to Bergen and left turn lane at Logan for eastbound traffic. The only section left is between Harvey and Fessenden. Once that work starts, it is expected to take about a month. Jill Schramm/MDN Youth with the New Town Eagle Feathers Dancers perform during the Downtown Festival on Main Saturday. Jill Schramm/MDN Minot Police Officer Aaron Moss visits with Noah Barnes as Maddox Barnes listens in the background. The Minot Police Department had a booth and police car at the Downtown Festival on Main Saturday, which included lots of activities for kids and families, including bouncy houses, games and entertainment. Submitted Photo Newly-commissioned 2nd Lt. Evan Thomas renders his first salute as an officer to Sgt. 1st Class Katie Buzick Aug. 18 during the graduation ceremony for Officer Candidate School Class #61 at the 164th Regiment Regional Training Institute on Camp Grafton Training Center, shown in this photo by Staff Sgt. Brett Miller. Submitted Photo Newly-commissioned 2nd Lt. Tony Kuhn is presented his second lieutenant rank by his wife and children Aug. 18, during the graduation ceremony for Officer Candidate School Class #61 at the 164th Regiment Regional Training Institute on Camp Grafton Training Center, shown in this photo by Staff Sgt. Brett Miller. Ashton Gerard/MDN Drivers from Nodak Speedway Chris Seekings, left, and Bob Fuegmann rappel down the Parker Center Saturday during the Over the Edge fundraiser for Minot YWCA. The event had raised around $49,000 for the women and children’s shelter as of Saturday afternoon.